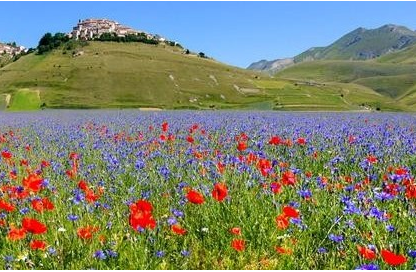 Umbria is the only Italian region having neither a coastline nor a border with other countries. It is known for its landscapes, traditions, history, culinary delights, artistic legacy, and influence on culture. The present economic structure emerged from a series of transformations which took place mainly in the 1970s and 1980s. During this period, there was rapid expansion among small and medium-sized firms and a gradual retrenchment among the large firms which had hitherto characterised the region’s industrial base. This process of structural adjustment is still going on. Economically the Tiber high valley with Città di Castello is the most important. 20–25% of Umbria’s GDP is represented by Terni steelworks and the processing companies. In Terni there are also many multinational companies in the branch of chemistry, hydroeletric, renewable energies, textiles. Umbrian agriculture is noted for its tobacco, olive oil and vineyards, which produce excellent wines. Regional varietals include the white Orvieto, which draws agri-tourists to the vineyards in the area surrounding the medieval town of the same name. Other noted wines produced in Umbria are Torgiano and Rosso di Montefalco. Another typical Umbrian product is the black truffle found in Valnerina, an area that produces 45% of this product in Italy. The food industry in Umbria produces processed pork-meats, confectionery, pasta and the traditional products of Valnerina in preserved form (truffles, lentils, cheese). The DirectorCiroBecchettideals with economic development and production activities, education, training, employmentmainly, cooperation, energy, craftsmanship, trade, tourism, trainee, innovation and research and credit for SMEs.